Break Free from Emotional Eating - Transform with Positive Energy and Joy! Do you often feel that your emotions are in charge and food is the only remedy? Are you frustrated that food is a constant companion? Do you struggle with eating when you’re not even hungry? Do you keep eating, even when you can no longer taste it? Do you turn to sugar as a way to “get through”? Or maybe you prefer cheese or potato chips? Are you addicted to your favorite cola, especially around 3pm? Are you exhausted, but resting feels impossible? Are you constantly racing time to fit it all in? Are you gaining weight? Maybe it’s just a little, or maybe it’s a lot, but the scale keeps going up? Do you feel that you eat pretty healthy, but can’t stay away from the late night snacks? I completely understand what it is like to turn to food for comfort. I know the endless routine to the day and how food can break up the monotony. I know how it feels to eat a whole pan of brownies shortly after eating a full meal. But good news! You are not alone. Every person eats for emotional reasons at times. Sometimes it may feel that you’re spinning out of control. But there is an end, a solution. You can step off the hamster wheel! I will help you to do just that! 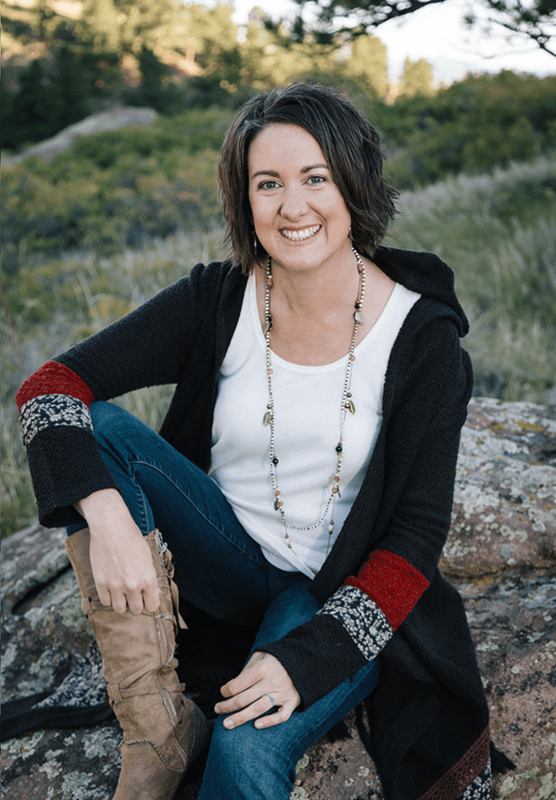 I am Amber Stevens, an Integrative Nutrition Health Coach and a Mindful Eating Instructor. Through my private practice, and my own experience, I have guided hundreds of people through their emotional jungle to come out refreshed and empowered on the other side. These journeys have helped me to uncover some universal truths to our behaviors, habits, and connections with food. And I have decided that they are way too good to keep to myself or to share with one person at a time! The End to Emotional Eating. 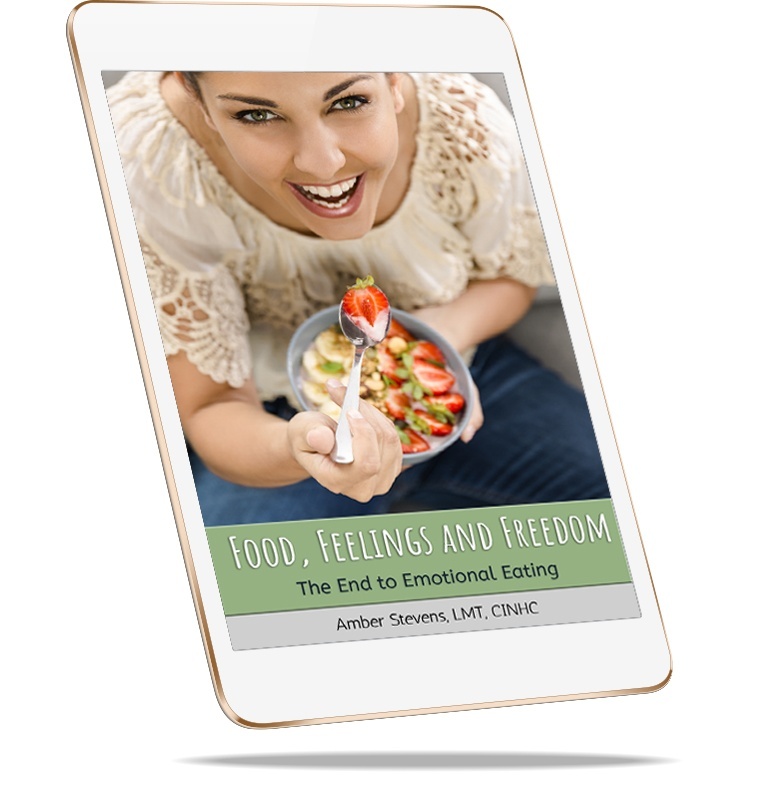 In Food, Feelings and Freedom: The End to Emotional Eating, you will finally gain the knowledge you need to take back control of your life. learn strategies to address the strong sugar and fat cravings. recognize the stress connection and learn how to release its hold. be guided through mindful eating techniques and mindset practices that elevate your state of positivity, no longer relying on food. learn the reasons that emotions direct us towards food. It may not be what you think! understand the hormones and other chemicals that propel us to eat. know the difference between emotions and feelings, and learn ways to change the feelings that no longer serve you. This ebook connects you directly to emotional states (boredom, depression, happiness, and more) giving you proven solutions to help you to better cope with your feelings. You’ll also get Insight Questions as an optional opportunity to journal and exercise your mind. These questions are specifically chosen to guide your inner wisdom for a full mind/body transformation. Finally, the ebook provides insight into some little known connections between your eating habits, sleep, hydration, and your microbiome in your gut (also referred to as our second brain!). So maybe you’re thinking “Amber this sounds great, but can’t I just Google this?”. The answer is yes and no, but mostly – why would you? This ebook is an easy to read guide with solutions specific to your emotional eating problem. Why create another problem by spending countless hours researching it on your own? You could spend time working one-on-one with me, but that would cost you a great deal of money and time (many hours to the tune of $100/hour). You could spend money on supplements that claim to offer happiness and peace of mind. But true contentment comes from within—not from a bottle. By learning and implementing the solutions in this ebook, you’re changing your relationship with your emotions and releasing your need to cope through food. Most important however, by reading this ebook, you can learn ways to free yourself – to no longer blame yourself or others; to no longer feel guilt and shame; to no longer escape through sugar and fatty foods. You’re truly loving your food – loving yourself – and living free! Buy this ebook today for just $24.97, and start an immediate change in your life. This ebook is fully formatted to easily be read on any device – it goes where you go! These are simple solutions, you can start using immediately! If you have access to healthy food, you can do this. If you have an open mind and open heart, you can do this. If you like to breathe, you can do this! 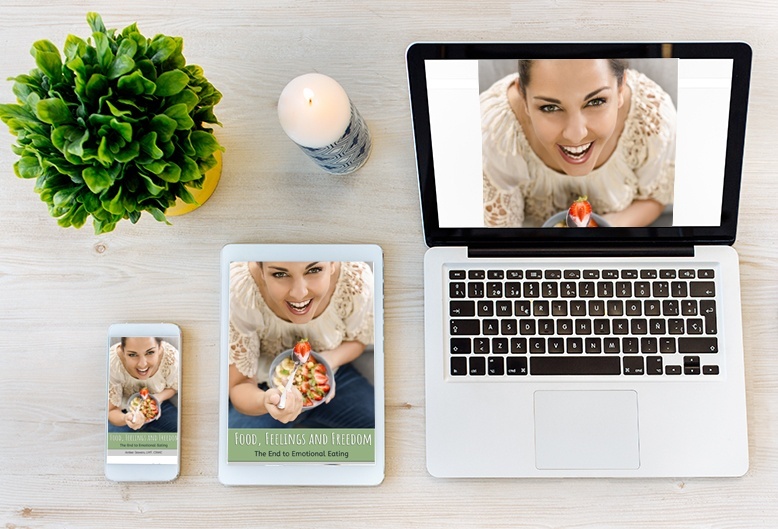 If you love to eat, you certainly found the right ebook! Now you know that you can start your life and health transformation right away – simply purchase, download, and start reading instantly! But it gets better. You get…. A Full 10 Days Money Back Guarantee! That means you have nothing to lose! Start reading it now, selecting an easy step or two to begin with and see the results for complete satisfaction. If it is not worth at least 100 times more than the cost…just let me know for a full refund. Are you finally ready to reclaim your life? It’s yours and it’s waiting! You don’t have to spend a lot of money on gadgets or supplements to feel better. You don’t want to put it off another day (someday is not a day of the week!). You don’t have to visit many doctors or therapists to find relief. And most importantly, you’re not in this alone. I am committed to your health and satisfaction with this ebook and others are beginning this journey with you! Love yourself enough to say YES to you!